We’ll thoroughly examine the pros and cons of selling a home For Sale By Owner in Putnam County NY in this article. As a result, it’s important not to mess up such a major, potentially life altering event without at least doing some research. Should you investigate local Realtors in Putnam County NY? Should you try to sell your home For Sale By Owner (FSBO) in Putnam County NY? What about a flat fee MLS listing in your local Putnam County MLS? You’re probably here because Realtors in Putnam County NY have told you that paying 6% commission in order to sell your home is some sort of law. Fortunately for citizens across this great country, it is not. We’ll go over the pros and cons of selling a home For Sale By Owner in Putnam County NY in this article as well as alternative approaches. Even if you’re about to sign an Exclusive Right To Sell Listing Agreement, it’s never too late to fire your selling Realtor for not informing you that commission rates are negotiable! Should I Sell My Home with Discount Realtors in Putnam County NY? Why Is an Agent Assisted FSBO so Effective in Putnam County NY? Let’s start on a positive note! The main benefit of selling your property FSBO in Putnam County NY is that you might be able to find a direct buyer and avoid having to deal with any Realtors whatsoever. This means you don’t want to deal with buyers’ agents nor the 75% of all buyers which they represent, nor do you want to deal with listing brokers or even flat fee MLS listing brokers. You may simply need to hire a transaction attorney for a couple of thousand dollars to do the paperwork for the transaction if you are lucky enough to find a real, direct buyer. This approach is only advisable if you have major trust issues and cannot stand having anyone else in the process except yourself. However, keep in mind that you will also be able to avoid paying any broker commission if you find a direct buyer through an Agent Assisted FSBO, otherwise known as a flat fee MLS listing. 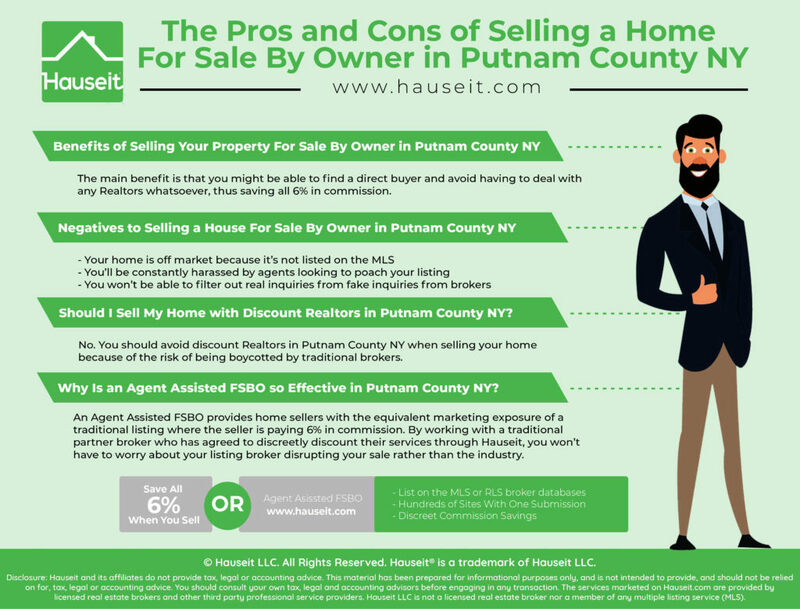 There are many critical considerations to selling your house FSBO in Putnam County NY. We’ll outline them below in order of importance. Your home is off market – Putnam County NY For Sale By Owner homes are considered off market because they are not listed in the Hudson Gateway MLS (HGMLS) which is the dominant Multiple Listing Service that covers the Greater Hudson Valley. As a result of this, you are missing out on the 75% of all home buyers who are searching exclusively through a local real estate agent. What’s worse, because you won’t have proper listing syndication as a For Sale By Owner seller, you’ll miss even more buyers because your property isn’t advertised on the hundreds of websites that MLS listings get automatically sent to. You’ll be constantly harassed by agents looking to poach your listing – It’s no surprise that the only people who exclusively search for For Sale By Owner listings are either hungry real estate agents looking for their next seller client or predatory buyers looking to take advantage of under priced FSBO properties. In fact, FSBO listings are such a great source of seller leads for solicitous real estate brokers that many pay lead generation companies for daily summaries of the contact information of new FSBO prospects. You won’t be able to filter out real inquiries from fake inquiries – Besides dozens of call calls from junior real estate agents day after day, as well as hundreds of email solicitations from Realtors asking you to list with them for 6% commission, you’ll also receive numerous emails from non-threatening personal email accounts that seem to be from direct buyers. Unfortunately, many of these direct buyer inquiries will be nothing more than fake inquiries designed to get your full contact information (e.g. you didn’t list your phone number) or to set up a showing whereby a Realtor shows up to pitch you in person with no buyer in sight! Offering to work for less is not an entirely novel concept. Discounting in real estate has been tried for as long as there have been real estate brokers. Unfortunately, most flat fee MLS companies and discount brokers are nothing more than mom and pop shows, one man operations or bucket shops that are little more than scam artists. Even the larger FSBO companies that claim to be “national” and available in all 50 states are essentially scams. They have company names that are highly offensive to traditional brokers in all of their marketing which are even watermarked on all of their listing photographs! These names are highly provocative, with phrases such as “agents be gone” or “owners only please” in the company name itself. How willing do you think other brokers will be to cooperate with someone like that? It’s almost as comical as it is sad. The fact is, over 90% of all real estate transactions in New York happen between two agents, a buyer’s agent and a seller’s agent. As a result, brokers need the cooperation of other brokers to be able to consummate a deal. How easy do you think that will be if the broker is a loudmouth discounter who’s going around insulting the very people he or she needs to work with? So the answer is definitely a no. You should avoid discount Realtors in Putnam County NY when selling your home because of their negative reputation and the risk of being boycotted by traditional brokers. We’ll teach you in the next section how to save on the seller’s broker commission without being boycotted. 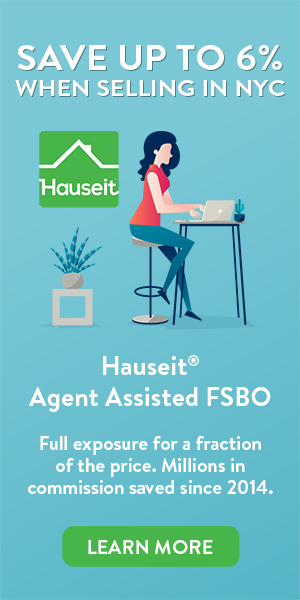 An Agent Assisted FSBO provides home sellers with the equivalent marketing exposure as a traditional listing where the seller is paying 6% in commission. 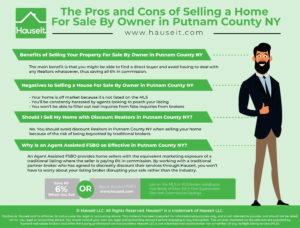 Hauseit accomplishes this by pairing Putnam County NY home sellers with a traditional, brand name real estate brokerage who has discreetly agreed to reduce its commission structure. Our partner brokers are real brokers in contrast to most flat fee or discount brokers, and most of our partner brokers’ business comes from normal commission deals. As a result, our partner brokers have great relationships with the wider brokerage community, and work with other traditional brokers on a daily basis. This means your flat fee or 1% for Full Service listing will be mixed in with our broker partners’ normal commission listings! No one will know you’re getting a better deal! The HGMLS requires listing brokers offer some form of commission to buyers’ agents, but it does not require listing brokers to reveal what they are earning in commission or what the total commission structure is. As a result, other HGMLS member agents will not be able to tell that you aren’t paying full commission! When you combine this obfuscation of the total commission structure along with brand name, traditional real estate firms who have secretly agreed to provide better deals, you truly get the real thing!